Owing to a combination of work and family, this was a comparatively light month for me when it came to movie watching. I only watched 20 films that were new to me, though they all were of a pretty high quality so it balances out. Even the worst film I watched this month - Dheeraj Akolkar's Liv & Ingmar - wasn't bad per se, it was just a fairly middling documentary about two great artists that I hoped would be better. It did make me want to watch (or rewatch) a bunch of Ingmar Bergman films in the near future, so that's one positive to come out of an otherwise not especially enlightening experience. Maybe my most significant viewing this month (aside from the ten listed below) was my rewatch (well, rewatches, since I watched it twice in one day) of Star Wars: The Force Awakens. Everything I loved the first time - its energy, the new characters, the fact that everyone involved seems so excited to be making a Star Wars movie - was still present and correct, while the stuff that bothered me - the way the film stops dead every time an old character appears, the entire third act - didn't bother me as much. Its place as my third favourite Star Wars film is increasingly secure. Right, to the business at hand. Here are the ten best films that I watched for the first time in April, 2016. For many years, my only knowledge of Shane came in the form of an homage to/parody of it glimpsed in an episode of Hey Arnold! which made it look kind of cloying and silly to me. Turns out that my half-remembered impression of one joke from a show that has been off the air for twelve years wasn't entirely accurate, because Shane is an incredible movie. Like the best Westerns of the '50s, it's a hugely entertaining rendition of the familiar beats of the genre (a lonesome gunslinger, crooked officials, elongated bar fights), a touching elegy for a way of life that faded away, and a compelling argument for why that way of life had to end. In telling the story of a man who comes to the aid of a community of farmers, who is essentially forced to care for other people, it embodies the nobility of men who decide to do what is right, even if it means violence and death, while also saying that such men probably don't belong in a civilised society. The death of The West has rarely been so fun or so melancholy. I must confess that I'm not a fan of Stanley Donen's Charade, an incredibly slight Hitchcock-knockoff that has somehow risen to classic status. Arabesque, Donen's followup, is in some ways a messier and less pristine film (Donen himself admitted that the plot didn't make much sense) but is an altogether much more fun experience. Donen's dazzling technique is on full display as he spins a story of espionage, assassination and intrigue around Gregory Peck and Sophia Loren. It's a charming, frothy concoction that has lots of visual invention (Donen's use of reflective surfaces is particularly beguiling) and boundless movie star charm from the two leads. It also gets extra points for a deliciously evil turn from Alan Badel, who is quickly becoming a firm favourite when it comes to portraying arch villainy. An oft-recommended film which I always assumed was solely about cycling (which is fine if that's what you're in to, but I'd rather be fed face-first through a jet engine than watch a single minute of the Tour de France) but is, in fact, one of the great coming of age films and one of the great films about America. Driven by an amazing cast (which includes Dennis Quaid, Jackie Earl Haley, Daniel Stern and Paul Dooley) and a great grasp of the frustrations of small-town life, it manages to take one young man's dream of being an Italian cyclist and turns it into an epic about the potential people have to be better than they are, even if that only amounts to beating the snobby college kids in a bike race. I was practically cheering during the finale, which is saying something given my previously mentioned dislike of the sport. As someone who finds a lot of Irving Berlin's music grating, it's a testament to how good every other aspect of Easter Parade is that I almost didn't mind that it contains roughly one million of his songs. Most of that is down to the charm and charisma of Fred Astaire and Judy Garland, who are fantastic as a veteran dancer and the young woman he takes under his wing, delivering the sparky dialogue and the musical numbers with great relish. Astaire gets the biggest showcase thanks to the physicality and grace on display in his performance of "Drum Crazy", but there is nary a moment in the whole film that isn't delightful. 3 Godfathers is an excellent example of how a potentially frivolous premise can become something deeply moving if treated in the right way. The basics of the film's plot - three bank robbers (John Wayne, Harry Carey Jr. and Pedro Armendáriz) stumble across a pregnant woman and agree to look after her baby when she dies in childbirth - sounds like it could be the basis for a caper. While there is plenty of comedy in the film, most of the focus is on the men's desperate quest for survival as they are hunted through a desert. It begins and ends in high spirits, but there is a long stretch depicting three men and a baby almost dying in a desolate wasteland. At once very entertaining and existentially bleak, it anticipates the same tone that Ford would bring to The Searchers eight year later. I'd seen movies with Jerry Lewis in before (most notably The King of Comedy, a firm favourite) but this was my first "Jerry Lewis movie". Having grown up constantly hearing jokes at his expense I assumed that he was some terrible hack, but this film alone demonstrates that he had tremendous talent not merely as a physical comedian, but as a composer of indelible images. Essentially a string of absurdist sketches starring Lewis as a hapless bellboy at a swanky Florida hotel, the film is a relentlessly silly and inventive work of slapstick which ably demonstrates how editing and framing can be as central to telling a joke as writing and performance. It's a lesson that a lot of comedy filmmakers seem to have forgotten in the years since. The courtroom drama is one of the sturdiest genres there is, coming as it does with an inbuilt structure (opening statement, cross-examination, closing arguments, verdict) and a natural engine for conflict. The problem that arises from a concept that can be easily replicated over and over again (as evidenced by the untold number of lawyer shows on television) is that it's hard to make an exceptional one. Breaker Morant is one such exception. An at times raucous retelling of a real trial of three soldiers over the killing of prisoners during the Boer war, it's a film shot through with gallows humour which also tackles the moral complexities of punishing men for war crimes when their superiors commit far worse atrocities and are lauded for them. It's basically Paths of Glory with bigger laugh lines and it's every bit as great as that comparison suggests. The more of Samuel Fuller's films I see, the more I'm convinced that he was one of the great American filmmakers. Certainly one of its best genre filmmakers. Not only did he make incredibly entertaining films, but he managed to sneak pointed social commentary in without becoming preachy. In this, the first film made about the Korean War, he uses the story of a group of U.S. soldiers forced to take refuge in a Buddhist temple to address America's racial, religious and class problems, while simultaneously arguing for unity in the face of the Communist menace. It's a film which manages to be rousing and patriotic while also being honest about the many problems lying under the surface of post-war society. Another Fred Astaire vehicle, though in this one he shares the screen with his frequent collaborator Ginger Rogers for a story of mistaken identity and surprisingly long musical numbers. The dance sequences (particularly the 20-something minute routine set to "The Continental") are obviously the highlights because you get to see two amazing performers at the top of their respective games, but the comedy and farce surrounding their situation - Rogers hires a man to make it seem like she's having an affair so her husband will divorce her, she then mistakes Astaire for the man she hired - is also sparkling and wonderful. Those segments tend to feel a little stagy - a sign of the film's origin as an unproduced play - but the dancing turns it into pure cinematic magic. 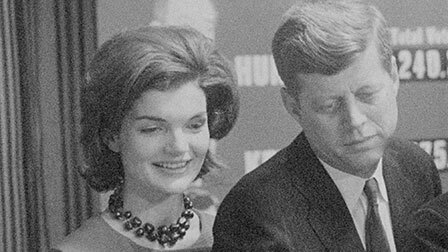 Recently released alongside a trio of other JFK-centric documentaries (Adventures on the New Frontier, Crisis, and Faces of November) by Criterion, Drew's pioneering film is a timely reminder that running for President has always been a dispiriting grind, though it used to be a bit more of an analogue experience. Given unprecedented access to John F. Kennedy and Hubert Humphrey as they participated in the 1960 Wisconsin primary, the film offers an up-close look at the speech-making, hand-shaking, and ground-level politicking that formed the basis of even the most sophisticated presidential campaign, at a time when it was a novelty to see a candidate being followed by one camera, let alone thousands.